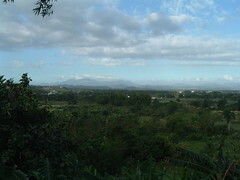 Cielo is a village in the barrio of Bayona, Santo Domingo, Dominican Republic. About 400 families live there, the vast majority of them profoundly poor in economic terms. They live in shacks made from pieces of tin, old wood planks, cardboard. The terrain is very hilly, with dirt paths leading from the main road, paved now, down to the lowest levels, shacks bordering both sides. Most houses have running water and electricity, when the Dominican government sees fit to turn their utilities on. I first visited Cielo in 2000, and have stopped counting the number of times I’ve visited; I think it’s 15 now. More information on the ongoing ministry can be found at Mission Emanuel’s website. My first trip to Cielo was difficult, but not for the reasons you’d think. Most Americans are apprehensive about setting foot outside their comfort zones of cleanliness, middle-class values, whatever. Cielo smells, more so back then than now. There were no paved roads; raw sewage everywhere; barely dressed or naked children playing in the dirt, with trash for toys. But the people were very friendly, even though we didn’t speak the same language. They have the same hopes and desires that we do. In most ways, they are so much more honest with themselves and with others than we are. They have nothing to hide, no masks to put on and take off, depending on who they’re with. One girl about 12 years old latched on to me the first day and stuck with me for the entire week. She begged me not to leave her. The word “abandoned” has always struck fear in my heart. I was never truly abandoned by anyone, but growing up an only child, latch-key kid from the age of 8, always the new kid at school (10 of them in 12 years, and I’m not an army brat) made me very aware of being alone, sometimes lonely, sometimes not, but alone most of the time. When this girl begged me not to leave her, I knew instinctively, what she was saying. Of all the places I lived growing up, the one place that feels most like home to me is in Southwest Virginia. CG knows where it is, because it’s where I met her. In a lot of ways, Cielo was like that place. When I stepped foot on the ground at Cielo, I felt like I had come home. Every trip to Santo Domingo includes a visit to a leprosarium and, yes, it’s exactly what you’re thinking–a place for people with leprosy, Hanson’s disease. I wasn’t really concerned about that, just more nerves about being somewhere vastly different from any place I was used to being. 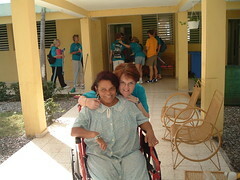 People at the leprosarium are in physical conditions ranging from completely normal to extremely disabled. They have been mostly rejected by their families and look forward to our visits. We bring them gifts, personal toiletry items, hard candy, socks, small stuffed animals. We sing to them; they sing to us. We minister to them; THEY MINISTER TO US. It’s a truly amazing, humbling experience to have this group of friends pray for you, and they do pray for us. One gentleman, blind from his disease, made friends w/ a college girl named Sarah one year. He asked her to have someone take a polaroid snapshot of himself w/ her. Then he asked her to place his finger over her face on the picture, and told her he would pray for her every day. The next year, when she came back, she went to see him and he said “Look Sarah! I prayed for you.” and showed her the picture. The image of her face had been worn away by his fingers as he had prayed. Friends, this is what love looks like. After my first visit to the leprosarium, toward the end of my first week in Cielo, we Americans got together to talk over the events of the week. I was already emotional, with feelings of home and friends mixed in with feelings of loneliness, abandonment. Someone in the group asked a general question about how we felt about the week, and a doctor on the trip with us said something like this: “It looks hopeless to me. How can one person make any difference? There are so many disposable people.” And at that moment, I became one of those disposable people. All of the feelings from all of the years came crashing down on my head, and I broke at the realization that, to this American, I could have been just as disposable as anyone he deemed to be in what, to him, was a God-forsaken place in the third-world Carribean: NOT the 1% all-inclusive tourist resorts, but the remaining 99%. Sometimes I still feel disposable, invisible. But to a group of friends and a small village on the outskirts of Bayona. I am one person who has made a difference, and has been changed from the experience. I have loved children, and they’ve loved me. I have taught women embroidery and knitting and chicken-scratch, and they have used those skills to earn money for food and clothes. Those same women have taught me valuable lessons on trusting God to provide when things look “less than Ideal’ because, in their world God is the constant provider, as He is here. The difference is that we don’t recognize God’s provisions because of our perceived self-sufficiency. I have helped build houses, a playground, a school, a church. And I have been welcomed into homes that are, sometimes, no more than tin walls with dirt floors. I’ve played on the playground, observed children in the classroom, and worshiped in the most amazing ways with amazing people. In Cielo we are all color-blind, members of the same family of God. In Cielo I am hermana, amiga, HOME. Some of my Cielo sisters. 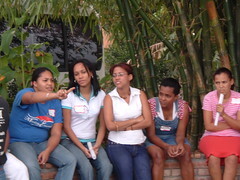 Marie Rosa, second from the right, is a special friend. My son and I helped build her home in 2002. I’ve taught her in sewing classes, she’s made painted plaster butterflies for me; they hang in my bedroom. And we talk, about faith, hope, love, sadness, discouragement, frustration, life. She is also a third stage breast cancer survivor. She calls me “friend”, and I am humbled.